In November, I talked about the at-times-excruciating wait for interview invitations. Now that it’s mid-January, the bulk of interviews are over. Several flights later, I’m settled back in Baltimore, excited to sleep in my own bed rather than a hotel, an Airbnb or a couch. The past two months have been wonderfully exciting and inevitably draining. While for the most part, they went smoothly, massive amounts of travel will always be littered with perks and mishaps. If a city has two airports, always double-check which airport you are supposed to go to. Returning a rental car to the wrong airport at 5 a.m. is not fun, rushing to the correct airport via Uber and missing your flight by 10 minutes is frustrating, and subsequently paying several hundred dollars to catch the next flight out is downright painful. Hotels are human too. One hotel accidentally upgraded me to club status. This led to free dinner on the club floor, a call to make sure the room was “to my satisfaction” and a waived hotel charge; I’m somewhat convinced they thought I was a hotel reviewer — oops? Another hotel accidentally gave me a room that needed maintenance and ultimately upgraded me to a room with a balcony (in sunny Southern California). As Alexander Pope said, “To err is human.” The good news is, as a hotel guest, you’re likely going to benefit from that error — appreciate it! Programs are also human! Programs make scheduling mistakes, coordinators miss emails and program directors are insanely busy. They also recognize that you’re human. If you need to leave an interview day early for whatever reason, whether it be getting to the next interview or just catching a more affordable flight out, let the coordinator know! More often than expected, the interview day ends earlier than what is written on the schedule, and you can catch that earlier flight, saving yourself time and money. Book flights that are flexible. Everyone I know, myself included, had to rearrange interviews and change flights more than once. Sometimes interview invitations come in late, and sometimes someone else on the trail may need to swap interview dates for personal reasons. Thankfully, Southwest Airlines allows you to change flights for free. I have friends who used other airlines and were required to pay as much as $200 in fees. On this note, I strongly recommend signing up for some sort of travel rewards credit card, as well as paying the $85 for TSA PreCheck — trust me, when you get to the airport late, it quickly becomes worth it. Schedule breaks. Interviewing back to back gets very tiring very quickly. If you factor in pre-interview dinners, two to three interviews per week becomes exhausting and leads to burnout. 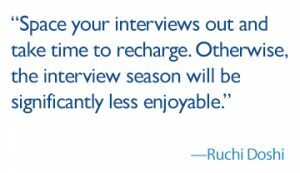 Space your interviews out and take time to recharge. Otherwise, the interview season will be significantly less enjoyable. Make friends on the interview trail. You’re all interviewing together — in fact, I interviewed with someone I knew or met on the trail at every single interview, including the first one — it turns out that it’s quite a small world, even among college students! Crashing on a couch with a friend who lives in the area is another, cheaper option and usually fun. Plus, you get an insider’s view to whatever city you’re looking to move to. Have fun! I got to spend time in some really cool cities I had never visited and at times took an extra night to explore new downtowns or simply spend a little time at the beach. I managed to eat some good food and spend some time with good company throughout the interview process. Ultimately, while I enjoyed the experience, I’m glad interview season is over. I’m not a fan of wearing suits (really, aside from Barney Stinson, who is? ), and while it’s fun to see friends on the interview trail, among the travel, time changes and nerves, it becomes exhausting. Now “all” that’s left is to create a rank list and wait for the official end of this process — Match Day 2017. One Comment on "Applying for Residency: Lessons Learned on the Interview Trail"